Enhance your experience of London’s iconic landmarks on a London Combo tour that combines a sightseeing tour with a luxurious London Eye experience. 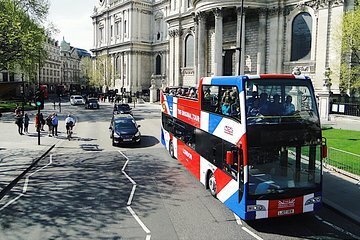 On a distinctive double-decker bus, you’ll admire famous London sights — including the Houses of Parliament and St Paul’s Cathedral — during a hop-on hop-off tour with a 24-hour validity period. Then, experience the London Eye in style as you sip champagne and gaze at panoramic vistas of England’s capital. Receive a free river cruise pass and access to three city walking tours with this London Combo. Take part in two of London's iconic experiences! See the views and culture of London up close as you pass through the historic and famous streets and landmarks, and then enjoy a luxurious flight on the London Eye, while sipping Champagne and viewing the famous sights of London from above. Relish the flexibility of setting your own schedule with this London Combo tour. Choose to take a hop-on hop-off tour first, then redeem your luxurious London Eye experience voucher within 30 days, or begin with the London Eye and use your 24-hour hop-on hop-off sightseeing pass within 7 days. On the hop-on hop-off sightseeing tour, you’ll explore three interconnected routes, depending on the sights you wish to see. Discover highlights like Piccadilly Circus, Big Ben and the Houses of Parliament on the Red Route; listen to live commentary as you cruise around central London on the Yellow Route; and delve into London’s museums and glamorous shopping districts on the Blue Route. During your luxurious experience of the London Eye, you’ll board a spacious pod and sip champagne as the iconic wheel completes its leisurely rotation. Additionally, gain an alternative perspective of London during a cruise of the River Thames, and choose to follow three distinct walking tours to witness the Changing of the Guard ceremony and to learn about the gruesome history of Jack the Ripper. Please see the Itinerary section for further details of each tour. Madame Tussauds, London Planetarium, Regent’s Park, Oxford Street, Regent Street, Piccadilly Circus and Eros Statue, Leicester Square, The National Gallery, Nelson’s Column and Trafalgar Square, Horse Guard’s Parade, Downing Street, Big Ben and Houses of Parliament, Lambeth Palace, Imperial War Museum, London Aquarium, London Eye, South Bank Arts Centre, BFI Imax Cinema, Covent Garden, Fleet Street, St Paul’s Cathedral, Monument, London Bridge, London Dungeon, Tower Bridge, Tower of London, Shakespeare’s Globe, Tate Gallery Bankside, Millennium Bridge, Catamaran Cruisers, Sherlock Holmes Pub, Westminster Abbey, Buckingham Palace, Hyde Park and Speakers’ Corner. Tour – Yellow Route:Explore central London with live commentary. Stay on board for the full 2-hour loop, or hop on or off at any of the stops. The route includes all stops mentioned on the Red Route except Madame Tussauds, London Planetarium, Regent’s Park, Oxford Street and Regent Street. These attractions are replaced with the Ritz Hotel, Royal Academy of Arts and Fortnum and Mason. Kensington Palace, Baden-Powell House, Natural History Museum, Science Museum, Victoria and Albert Museum, Brompton Oratory, Harrods, Knightsbridge, Harvey Nichols, Hyde Park, Ritz Hotel, Piccadilly Circus, Shaftsbury Avenue, British Museum, Russell Square, Wellington Museum, Royal Albert Hall, Albert Memorial, Kensington High Street and Princess Diana Memorial Fountain. Transport Link – Black Route:Use this route to travel between the main London transport hubs of St Pancras, King’s Cross, Marble Arch, Paddington, Marylebone and Euston. Transport Link – Green Route:This route provides a handy loop around central London, stopping at Leicester Square, the London Eye, Westminster and Piccadilly Circus. Transport Link – Purple Route:Use this route to travel around west London, stopping at Holland Park, Notting Hill, Bayswater, Kensington Gardens, Paddington and Madam Tussauds. The following complimentary activities are subject to availability on the day of your tour. Thames River Sightseeing Cruise:Simply hop off your sightseeing bus at either Big Ben and the Houses of Parliament (Westminster Pier) or the Tower of London, and then walk the short distance to the pier. Show your hop-on hop-off ticket and step aboard the boat to begin your river cruise. Take in spectacular city views from out on deck or relax by the windows inside the boat as you glide up and down the Thames River, with top London attractions such as the London Eye, Tate Modern and St Paul’s Cathedral drifting slowly by. Walking Tour – Changing of the Guard:Meet your guide at The Original London visitor center in Trafalgar Square at 10:30am. Stroll past St James’s Palace on your way to Buckingham Palace, and then watch the time-honored Changing of the Guard ceremony taking place. In time to drumbeats, soldiers from the Queen’s Foot Guard march in front of the palace in their red tunics and bearskin hats. Walking Tour – Rock ‘n’ Roll:Start at The Original London visitor center in Trafalgar Square at 1pm then set off to explore the capital. Discover famous venues and sites linked to rock ‘n’ roll legends of the past few decades. See where the Beatles were nearly arrested, the venue of Jimi Hendrix’s last gig and more. Walking Tour – Jack the Ripper:Leave the bus stop at the Tower of London at 3:30pm with your guide and walk around Whitechapel in London’s East End. Follow the trail of London’s infamous serial killer, hear murderous tales from the city’s dim and dark past and see the places that gave the Ripper his notorious acclaim. My friend and I did not make as much use of the Hop-on Hop-off tour as she could not walk very far and we couldn't always locate or get to the on and off points. London Eye was definitely a great experience, made better by skipping the lines and the champagne on the ride up. Such amazing tour guides throughout! Really made a nice impression on my two kids. Apart from the weather...rained all day and the traffic...horrendous the tour was detailed and informative and a great way to get round the sights. Would recommend. The Eye is amazing and the bus tour was good to see all the major sites. Disappointed when we arrived at the Eye ticket desk and were told that there were no more spots available for the Champagne Experience. We were not informed that there are limited spots for the Champagne Experience and all were booked solid. Since the Eye was scheduled for closure due to maintenance starting the next day, this was our only opportunity to go on it. Staff offered us a spot but we lost out on the celebratory aspect. The view, however, was spectacular and there was plenty of time to take pictures of all the sites. An excellent way to get around London and see a lot. The Champagne Experience was fabulous! You do have to book a time in advance for it they do it every hour on the hour. Fortunately, we were there about 20 min before the next group was to board and we got in! It was wonderful and our guides pouring the champagne were friendly and helpful for pointing things out. The bus took a little longer to get during traffic than expected. London Eye Champagne Experience was the BEST! That is a not to miss experience, champagne added a little sparkle. Our kids enjoyed drinking their beverage out of a fancy champagne glass too.